SwissGear Sion 21" Review - Is this luggage a bang for your buck? Travelling is a basic part of our lives, some travel more often, some travel at times but we do travel :). Whether if we are traveling frequently for business trips, going on a trip with family or an adventurous trip with friends, traveling is always fun. When we talk about traveling, packing is the first thing comes to our mind. We usually like to travel with our clothes, Tech gadgets, and other accessories. To carry these things around with us, we will surely need a bag. If you are looking for the best bag to carry with you on frequent trips, voila, you are at right place. Here we found an Ideal bag you should consider if you like to go on long trips. So, here we present a complete in-depth review of SwissGear Sion 21″ Black carry-on luggage bag with all pros and cons. We will also provide you with the best buy link :). 1.1 Why I Loved It? You may have already heard the name SwissGear Sion as it is pretty common and well-known brand that provides us bags with excellent quality and features worldwide. And when it comes to SwissGear, Sion 21” is the clear example of the brands Excellency. Whether it’s about look or about features available, Sion 21 has it all with some extra decent features. 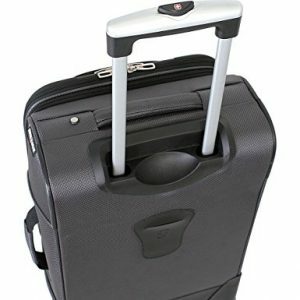 Clearly, as it is a carry-on bag it is a small bag but is a complete package for your travel. This bag is light and compact but efficient, durable and classy bag presented by SwissGear. When I say light, believe me, the bag is very very light but durable. This bag is one of the best from SwissGear’s collection because of some excellent features that are pretty good for a carry-on luggage like this. And the best thing I like is the affordability of this bag. As mentioned earlier we are reeving the smallest 21” variant here though it has other options too. There is a whole lot of room available in the bag hence can be a good deal for the whole family. The bag is pretty wide, 13.5 inches to be accurate and as mentioned earlier height is 21 inch. Though the bag is pretty compact, you can easily fit in some extra accessories when required, which happens very often. The time I am writing this review, the bag is only available in black color which is dope but maybe there will be other color options will be available in the coming future. I personally loved this bag and still carry this one with me on longer trips. The look, the ease, the durability, everything is tremendous, to summarise, I may say this piece of luggage is a perfect pick for you. The bag stands on 4 wheels which are as smooth as butter and can turn 360 degrees round; hence the bag can be carried around easily. The outer bag mainly constitutes big exterior compartments made up of polyester, and two of the main sections with excellent zipper performance and straps crossed around for extra protection. The telescopic handle is handy enough for your use and there are two extra handles on the top to make everything easy for you. The wheels that can easily move in any direction Makes a plus point for this bag. The body which is very sturdy but still as light as feather (: V). The bag if full can be expanded few more inches for your ease. The dope vintage look makes the bag a better pick in its budget. Other great features are the profound main slots. The bag is approved by me and the brand to be a perfect carry-on. There are loads of compartments with few at the front. The price the bag comes from; the best one I have ever reviewed under 100 bucks. 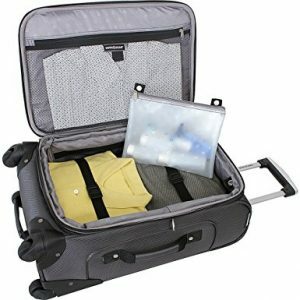 Well, there are some other features like adding or decreasing the capacity using few zippers to help you pack your necessities. Type of the bag is in Softshell spinner category. Dimensions of the bag are 20 x 14 x 7.0 (8.5) in inches. The bag weighs around 7.5 pounds which is pretty light I should conclude. When I am writing this, the bag costs around $85. The color we are reviewing here is black but the bag is also available in, grey, pewter, and blue with Teal accents. 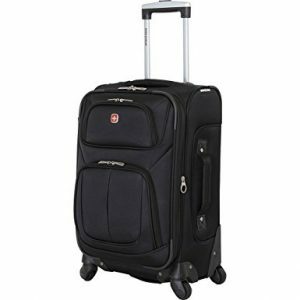 The SwissGear Sion Spinner 21” has 4 360 degree wheels that will help you to drag the bag around with complete ease. 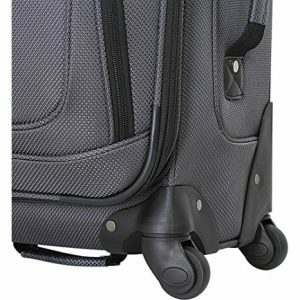 Technically there are 4 wheels which can freely go in any direction and are strongly bound to the bag so will never fall off. This is not the First bag I am reviewing but believe me with my personal experience I can easily say the Wheels are perfect for this bag and I cannot complain at all. The sturdy light bag with such great wheels is perfect I may conclude. The only thing that irritated me was the sound they made, which wasn’t very loud though but still cannot be ignored, though lubricating them once worked for me so no issue about that. And yes the wheels are pretty small as the bag is compact, you may be uncomfortable at the sideways but the lightness of the bag comes into play at that time so don’t worry at all about the size of the spinners. I may conclude the quality of wheels is pretty good if we talk about this price range and hence let’s move further to other features. First of all, remember the bag I am reviewing comes from one of our favorite brand SwissGear so the Durability of the bag is best in class no issue about that. The weight and comfort of the bags sometimes make me wonder how the company managed to make such a handy bag this much sturdy I mean there must be some science used in this, I mean the perfect material they have used. Though they used polycarbonate on the exterior that does not add any weight to the bag. What more can we expect when these features are more than our expectations in this price budget of eighty-five bucks. So, the bag is sturdy enough as per my experience with this bag, let us move to other feature I Liked about this one. The overall design of Sion 21 is well built by Swissgear, let me tell you why. The no of compartments available is a plus point and the fact that their size is adjustable makes is a bonus. The size of the compartments is adjustable with the help of few extra zippers included in the Sion 21. In the modern tech world, the bag has perfect compartments in the bag. You can put your laptop in one of the front pocket and your mobile and charger in the smaller compartments. If you still need more storage then you can opt for SwissGear Sion 29" luggage bag. There are other smaller pockets to keep paper works, files, chargers, earphones, ID cards and other documents you may need to carry. So, the design is perfect for a modern age Bag. I think I have used the word perfect many times which I may not deny but there are some complications too. So, let us move to our next section of pros and cons. The quality of the zippers provided by SwissGear is always good. Sophisticated, handy and elegant design. Very smooth sturdy high-quality 360-degree spinner wheels. External compartments are easy to reach and preach. The brand SwissGear itself is a pro for me as I have seen pretty good bags from them. The color and style of the bag is very elegant. The Deepness of the compartments comes handy in longer trips like foreign tours. I should start with the handle; I found that while the bag is pretty durable, the handle of Sion 21 is not very sturdy and can break after a period of time. Be careful there. Also, I thought the quality of handle isn’t good while unboxing the carry-on and hence I am very careful about that since the very beginning. I already mentioned about the size of the wheels but don’t worry as the bag is light. I didn’t face any other issue with the bag yet; good job there SwissGear. So after the whole review and Pros and con, I may conclude that after using the SwissGear Sion 21 is very good and well-built carry-on bag and in this price, you should without any second thought buy this bag if you are looking for a Carry On.